The remodel has been a while in the making, but it's just about complete now. For all of you that have been here "before", you will really appreciate the changes to the space! I'll take you on a virtual tour, so you can come inside and enjoy the space with me! The first picture that was hung on the wall HAD to be my favorite. It was a gift from my hubby (who is also my biggest fan!). ......and this is a better view of the shelves. I always have yummy candles nearby! If you are wondering what that blurry orange light is coming from, that's actually a light box that is connected to the stereo. It flashes different colors depending on the notes in the song. (Big hugs to Dad for that one!). On up the next wall is the table with the computer for customers to choose their designs for the Gammill Statler, and also another table that is folded down against the wall. This is the back wall, and the pictures that are above the carts I use for storage. My bobbin winder is right out there in the open in this picture, but it's easy to stow below. The last wall brings us back to the staircase, and has a nice warm sunshine design on it. With the mellow color on the walls, it feels like a sunny day all the time! ..... use paper plates!" That's the name of the most recent quilt from a fantastic artist Kim Montagnese. 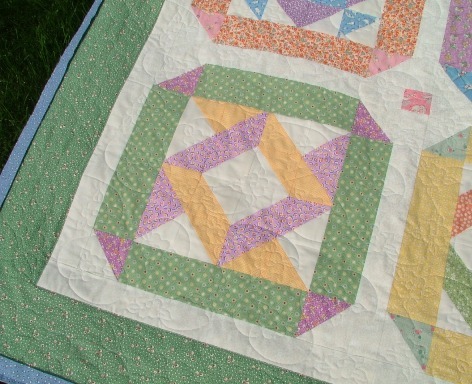 This quilt is a new twist on the old favorite Broken Dishes. 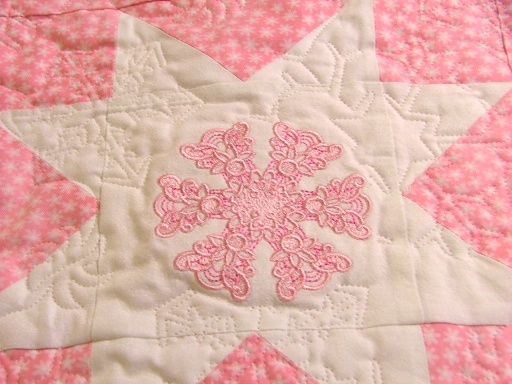 Kim added lots of fun to this quilt pattern with a new method of applique, rubber stamping, and even silverware! My favorite part is the expression stamped on the quilt top that says "You can lead me to the kitchen, but you can't make me cook". That's fits me perfectly! 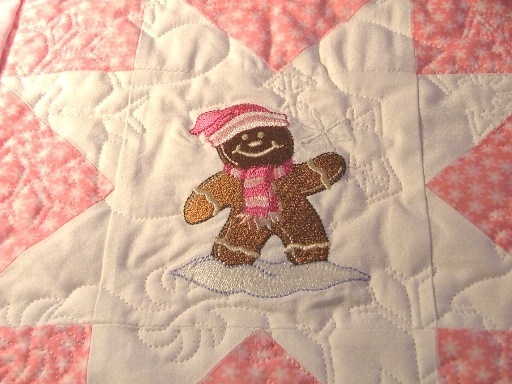 There's a cute story about what happened when Kim was working on this quilt over at her blog Colorz My World. She had a little "boo boo" that needed a band-aid -- literally! Kim sells her patterns, and teaches fun classes on making them. You can reach her by sending an email to Kim Montagnese at Montagnese@oh.rr.com. 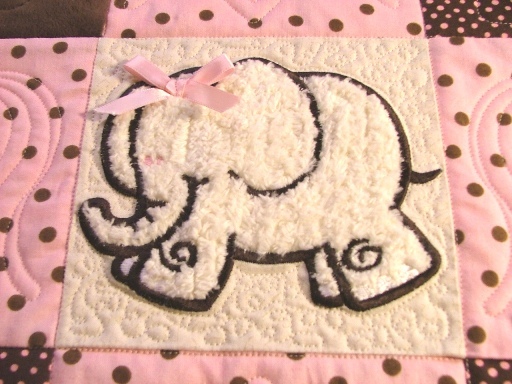 For our third addition to the quilt, we added this same design to the piano key border. Each of the keys were four inches long, and two inches wide. You can see how multiple additions of this design, side by side (instead of lengthwise), created a powerful statement! The old expression is true --- sometimes less really is more! Designs have a way of taking on their own life, and it can be very tempting to use as many as possible in an effort to show them off. Keep it simple, and let the fabrics and piecing shine through! 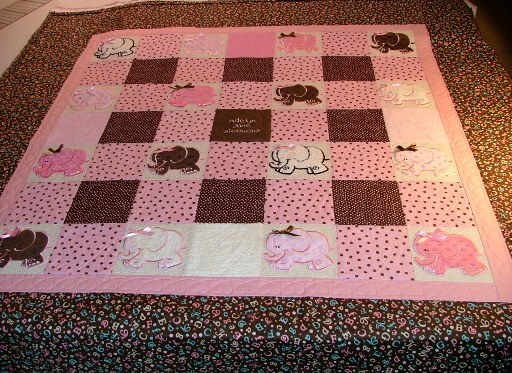 Everyday, I hear this same question --- how should I quilt this? Anyone in the business of doing long arm quilting knows that there are a hundred different ways to approach the same quilt top. OK, maybe not a hundred .... but you know what I mean. 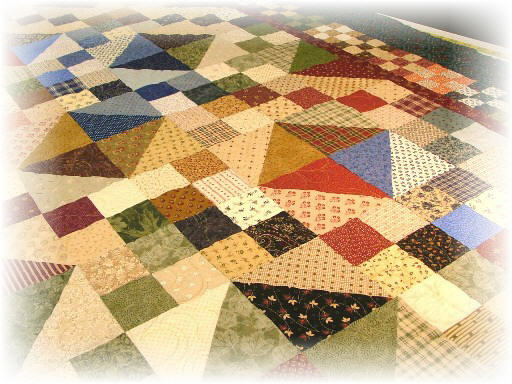 Customers who bring their quilt tops in for quilting service are often at a loss for what would look best on their quilt top. They have spent countless hours creating a family keepsake, and when it is finished they want to have a quilt that will be beautiful enough to pass down to future generations. Often, these folks have spent quite a bit of money (in addition to all of that time!) 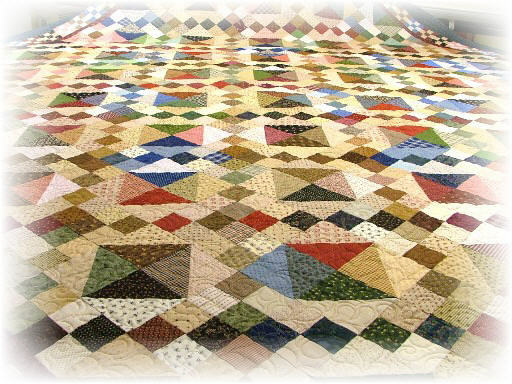 on fabrics, patterns, books, batting, tools --- maybe even classes to learn how to make this beautiful quilt. But when I ask them how they envision the final step -- the actual quilting -- some are at a loss with what approach to take. There are a few things to consider in this decision making process. Most importantly --- how will this quilt be used when it is completed? 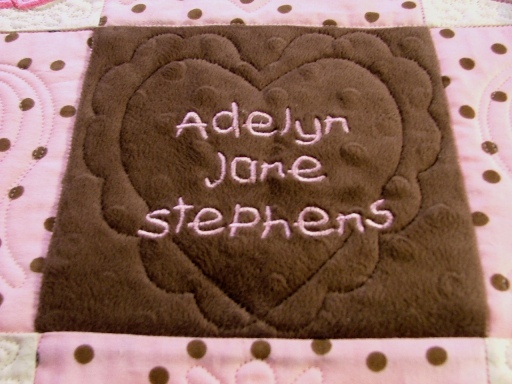 Will it be hanging on a wall, resting on a table top, or used on a bed or as a lap quilt? 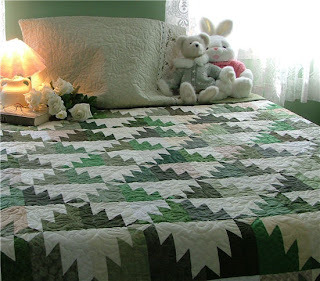 If the finished quilt is going to be used on a bed and frequently laundered, then the best method of quilting is usually an overall design, known in quilt lingo as an "edge to edge" design. 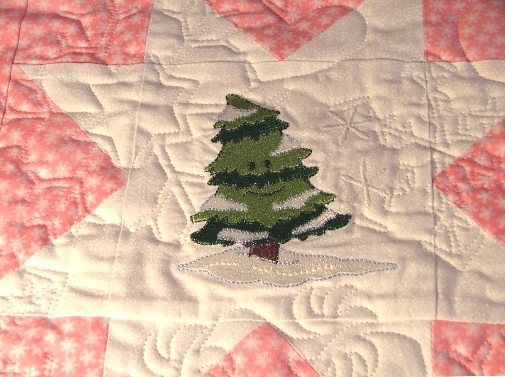 The more often a quilt is laundered, the more the layers shrink causing the tiny details in some quilt designs to become lost in the texture of the surface. 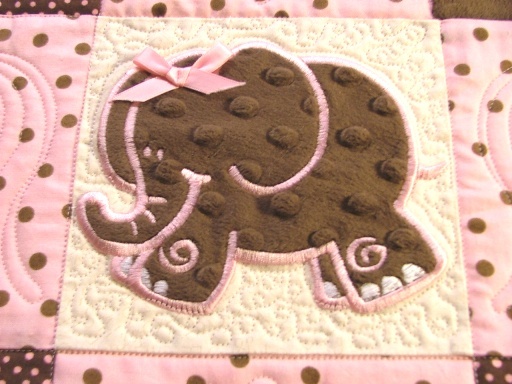 On the other hand, if a quilt will be used as a table topper, or on a wall, or in a quilt contest ... then custom quilting of small individual areas will really make the quilt top sparkle. 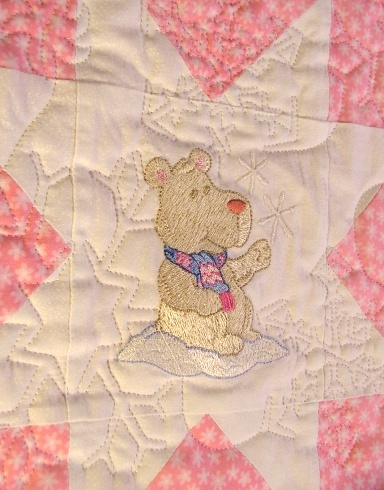 Will the quilt be going to a child or adult as a gift? 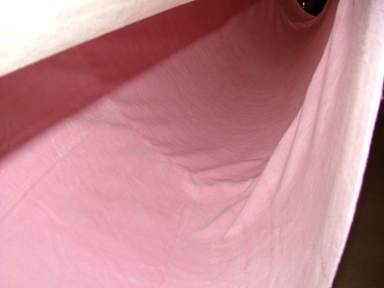 Are there any fabrics in the quilt that could bleed if the quilt was laundered? 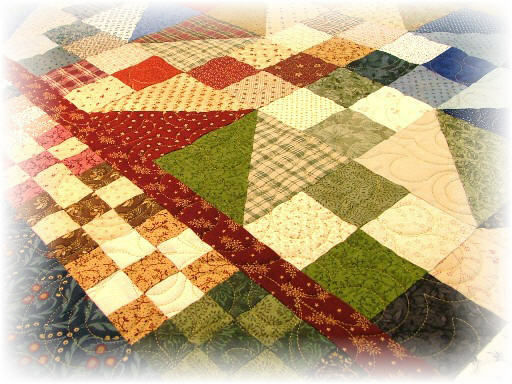 If the quilt is a gift, think about the type of designs that would suit the recipient of the quilt --- masculine, feminine, juvenile, etc. Will the dog be sleeping on it? 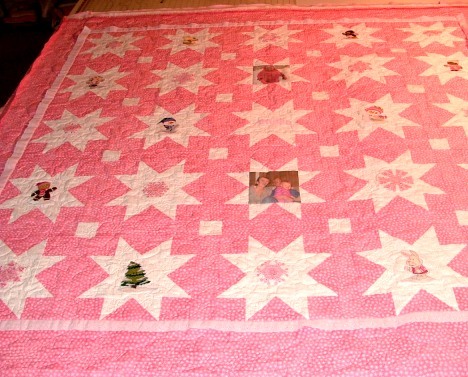 To show you an example of the same quilt done in two entirely different methods, I have taken pictures to demonstrate. We knew that this quilt would be hung on a wall, and used for decorative purposes only. 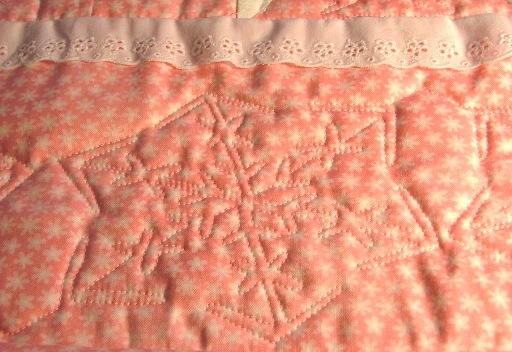 Therefor, it was an easy decision to stitch each block and sash separately, and use another design in the outer border. 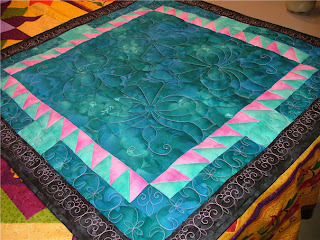 This same quilt, used as a laptop quilt, is much better suited to having the "edge to edge" approach. 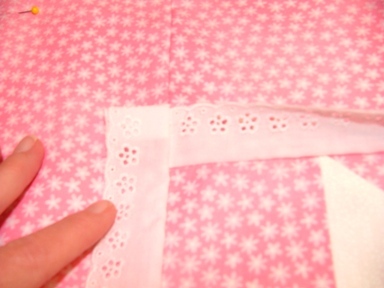 There is an even distribution to the quilting stitches. 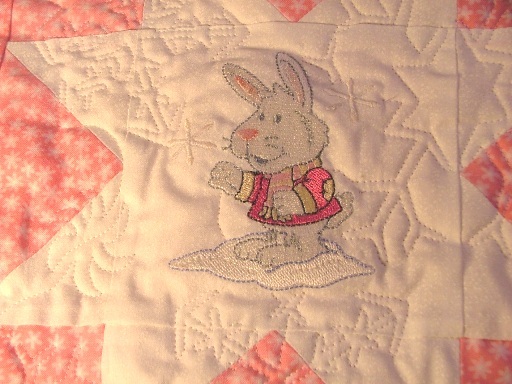 When this quilt is laundered repeatedly, it will remain looking nice for many years to come. While cost and end use are considerations when making a quilting choice, the most important thing to remember is that you are the artist! After spending so many hours to achieve the finished quilt, you may have a vision of how you want to see the quilt finished. Always work together with a long arm quilter who can share your vision, or who can help you decide what that vision should be. Have you ever felt that you would run out of space for yet another quilt? The beds are covered, the walls are covered, the table tops are covered --- even the dog is wearing quilted jackets! 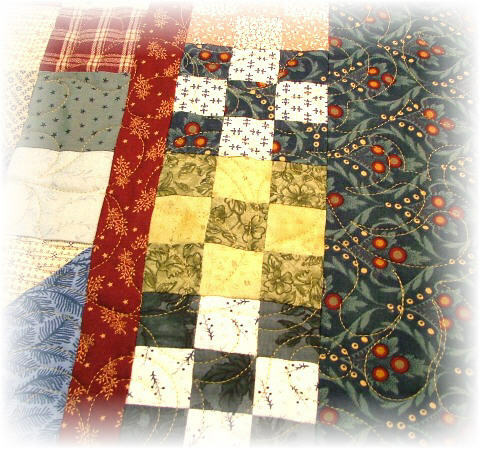 A nice idea for a small quilt is hanging it on a patio door or window. Let the sun shine through it and highlight your beautiful stitches! Here is a new wall-hanging made by Lyn Christian of A Design by Lyn that will hang in a sunny spot soon! 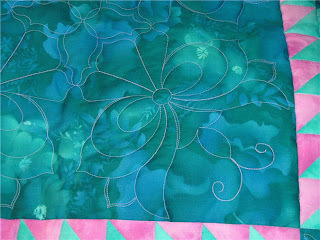 Lyn's quilt has butterflies in the center panel that can be highlighted with crystals, and the borders could be done, too. Here's a close-up of one of the butterflies. 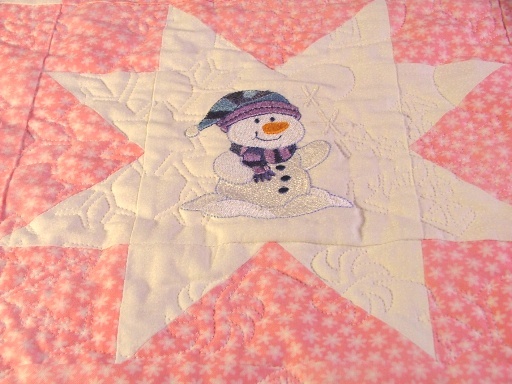 There's always a good reason to finish up those small quilts! And now you have a new place to hang them! 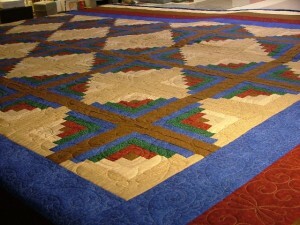 I'd like to share a few pictures with you of a quilt that I have just finished called Scrappy Mountain Majesties. This was done with a pattern that I saw at Quiltville, and it was tons of fun! I used up lots of different shades of green from my stash. 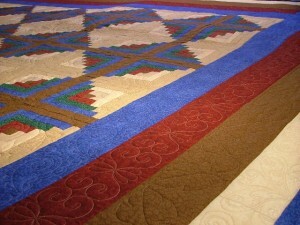 You could use any combination of colors to create a truly scrappy quilt in all different colors. 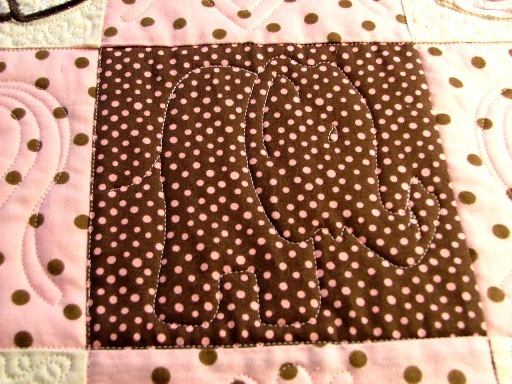 It's also a fun project to do with friends, because you can take full advantage of the "assembly line" style of sewing. 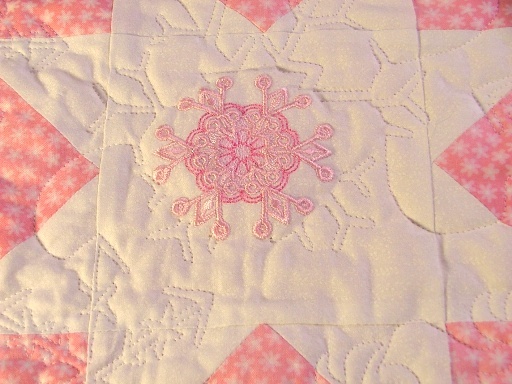 Here's a close-up of the quilting used on this project. 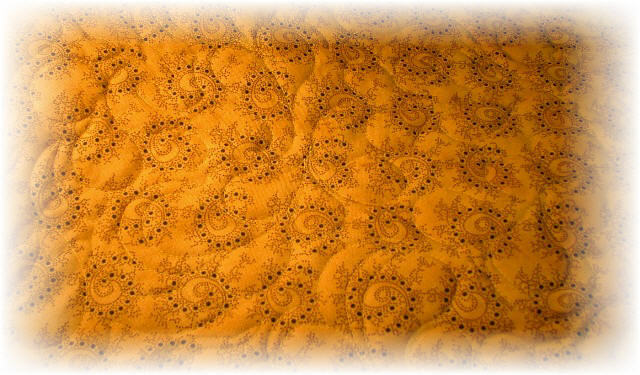 The patterns I used are called Gilded Deluxe Friends, and they are available through Anne Bright. Anne's patterns always have coordinating borders, squares, triangles, etc.... and just really brighten up any quilt that I have used them for. 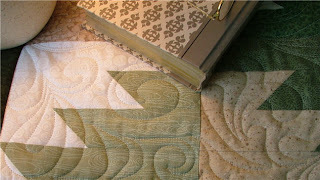 These designs are for use with a Statler Stitcher -- the computer-aided long arm quilting machine made by Gammill.